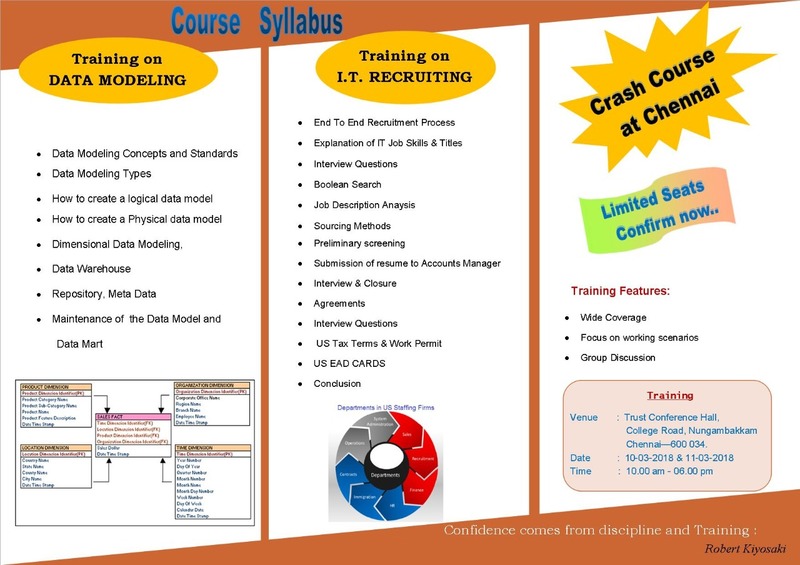 Course Start Date: Training will be provided as per your convenient time slots! Please call us at 91-9080157239 for more details! How to Backup / Delete / Recover a SQL Server Database? How to Export / Import Data from SQL server? How to Detach / Attach a Database? What is Server Login / Database User / Schema / Role / Privileges? What is composite primary key? What is composite foreign key? Introduction to Software Development Life Cycle. What is a Desktop Application? What is a Browser Based Application? What is a Mobile Based Application? How to truncate a Table? How to Create / DROP NULL and NOT NULL? How to Create / Drop Primary Keys and Composite Primary Keys? How to Create / Drop Foreign key Constraints? How to Create / Drop Unique Constraint and Composite Unique Constraint? How to Create / Drop Check Constraints? How to insert, delete and update date in a table? How to frame a Select Statement on all columns? How to frame a Select Statement on few columns? What is WHERE clause? How to select all records and few records? How to use different conditions in where clause? How to sort and unsort the data? How to use Boolean operators in where clause? How to use Arithmetic operators in where clause? How to use IN operator in where clause? How to use comparison operator in where clause? How to use NULL and NOT NULL in the where clause? How to use predefined (default) functions? How to use set operators like UNIION and Intersect? How to use Mathematical Functions? How to use Character Functions? How to use Advanced Functions? How to use Date Functions? What is Grouping the data? And where it will be useful? How to combine GROUP by and HAVING? What is a Sub Query? What is a Nested Query? What is co-related Sub Query? How to analyze the requirement? How to find out entities and relationships through Normalization Techniques (1NF, 2NF, 3NF)? How to draw E-R (Entity Relationship Diagram)? – One to One, One to many, Many to Many, Self-Referential Integrity (Recursive), Cardinality and Optionality. How E-R data (Normalized Data) is converted into Tables? What are the duties and responsibilities of a SQL Developer?